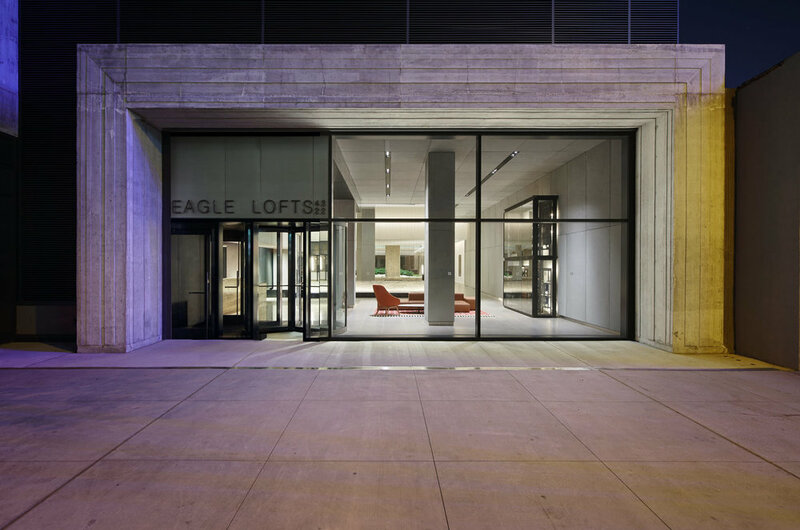 By renovating the 100 year old Eagle Warehouse in Long Island City and adding a 54 story apartment tower, the team created almost 800 new rental units. The historic warehouse contains loft rental units as well as 35,000sf of shared amenity spaces. To create well-lit habitable lofts from the huge floorplate, the existing central courtyard was enlarged significantly and sculpted into a central garden landscape. We designed all the interior public amenity spaces—this includes the lobby, lounges, rental office, library, gym, children’s room, corridors, and elevator lobbies. Our design lodestar was to preserve and reveal the unique, brutal elegance of the existing historic industrial structure while delivering community-driven public spaces that capture an uncomplicated, even relaxed, sense of luxury. To elevate the existing rough exposed existing concrete structure, we sourced a highly articulated travertine stone that picks up on the same colors, tones and patterns- creating an equivalence between the luxurious stone and the found concrete. We retained and celebrated the historic industrial artifacts and views. 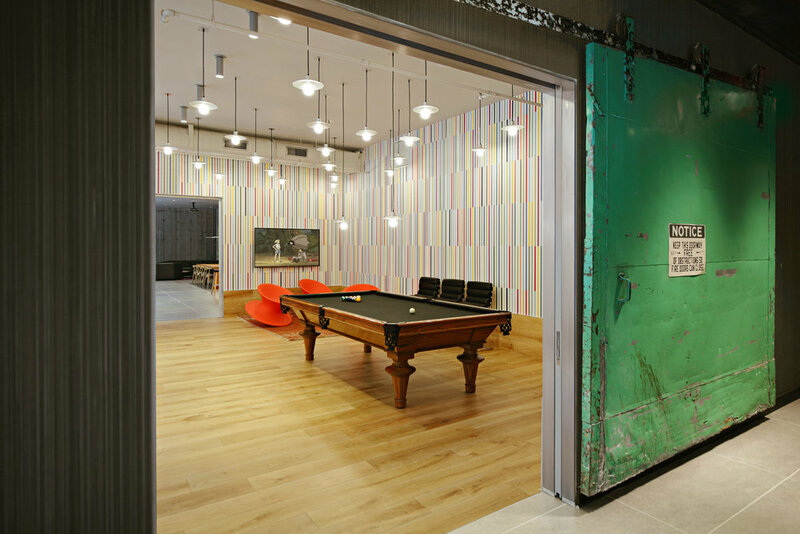 In a direct preservation of the history of the site, electrical equipment from the original building was salvaged and mounted onto custom designed steel armatures preserving and celebrating these artifacts in the new lobby. Additionally, an extensive large format photographic survey of the pre-renovation warehouse was completed and these images were reprinted at actual size and mounted on the walls of renovated spaces. Thus, in a single view, one simultaneously experiences the pre-existing industrial factory view juxtaposed with the renovated space. This comfort with the industrial roots of the site signals a supreme confidence and pride in the authentic Long Island City heritage and history of the building. Another priority this project was to articulate the intersection of the courtyard landscape with the urban hardscape. To this end, the main lobby reinterprets the streetscape, pulling it into the building as an abstract stone and concrete hardscape. This incorporates the existing structure as well as new stone, concrete and tile finishes - all treated in an equivalent way. Similarly, the new courtyard landscape is pulled into the building; landscape and hardscape intersect in an interior skylit garden of plants and rocks.